Whether you have an important event coming up or you simply don’t like going to the beach, but still want that healthy, sun-kissed skin glow, indoor tanning lotions are a must if you plan on using tanning booths. They will keep your skin hydrated, give you the wanted results faster and help to make them last longer. 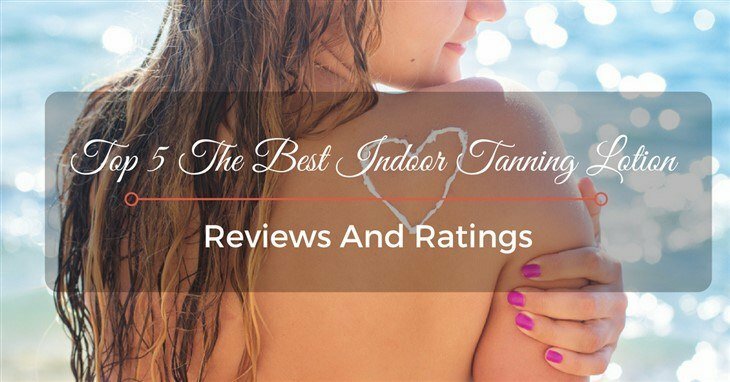 Stick around to find out more about these products – what they do and how they do it, and what are the best indoor tanning lotions 2018 which are available on the market. What Are Indoor Tanning Lotions and How Do They Work? Indoor tanning lotions are products made specifically to accelerate and enhance the tanning process by promoting the production of melanin, the natural pigment found in our skin; you should always apply them before using a tanning booth. The main difference between outdoor and indoor tanning lotions is the fact that, instead of blocking UV rays, these lotions capture them and enhance their effect. Keeping your skin moisturized – Tanning will significantly dehydrate your skin – imagine heat and light working together in a small space. That’s why indoor tanning lotions are so important – they are filled with ingredients that will help keep your skin moisturized and healthy. Making your tan last longer – Because they keep the skin hydrated, it typically peels a lot less, so your tan will last longer. Eliminating the odor caused by tanning – When you’re using a tanning bed, you usually experience some odor caused by the bacteria found on your skin. Many indoor tanning lotions combat this by using anti-bacterial ingredients and different fragrances. Enhancing your tan – Not only will the use of an indoor tanning lotion make you tan more evenly, but it will also enhance your natural tan and give it that summer-kissed skin glow. There are many upsides to using an indoor tanning lotion, so they seem like a smart choice for anyone who plans on using the tanning bed or booth – and they are. However, there is a downside to it, too, that I feel obligated to mention to my readers – many of these lotions contain DHA. The DHA causes chemical changes on your skin, thus giving it a temporary change in color – all this by reacting to dead skin cells. Why is DHA such a problem? A study was conducted about the long-term effects of DHA, and it proved that it could cause some damage to skin cells and even your DNA. What I’m trying to say is, if you plan on using the indoor tanning lotions regularly, you should opt for the ones that do not contain DHA as an ingredient. If you’re new to indoor tanning in general, let alone the lotions, I imagine searching the market might get a bit confusing. To make it easier on you, I’ve made a list of the most common features found in tanning lotions and what they all mean for you, the user. Bronzer – To give you a darker than almost immediately, many indoor tanning lotions have a bronzer in them. The higher the amount of bronzer in the lotion, the darker the resulting color will be. Tingle Lotions – The tingling sensation you experience when you use these products is the increased blood flow to the skin, which increases the amount of melanin. Shimmer – As long as you don’t over-do it, a little bit of shimmer on your skin will give it a glowing appearance. Accelerators – These could be called beginner-level indoor tanning lotions – they’ll provide you with a natural base tan. Also, they usually contain a lot of moisturizers to keep your skin healthy and hydrated. Intensifiers – Once you get a base tan using accelerators, you can move on to intensifiers; these are meant to help you get the darker color you want, no matter what your base tan is. Can you afford to use it regularly? This product, made by Millenium Tanning, is currently among the best selling ones and it’s no wonder – it has a lot to offer for a rather reasonable price. The first thing worth mentioning is the feel of the lotion; the consistency is just right. However, you need to make sure you apply it evenly; if not, you may end up with some streaks, even though it’s not a common issue with this product. There are many natural ingredients in this lotion that are in charge of keeping your skin hydrated and healthy-looking. By being properly moisturized, your skin becomes smoother and softer and, most importantly, it handles the damages of regular tanning booth usage a lot better. Some of those key ingredients are oils like carrot seed oil, pecan seed oil, sunflower oil and different herbal extracts. If you decide to give this indoor tanning lotion a chance, you’ll be left with a darker tan color in just a few days, one that will turn heads wherever you go. The fact that it doesn’t take long to work makes it ideal for unexpected events where you need to look your best, but don’t have the time to go to the beach. Let’s start by explaining what „50X Auto-Darkening Tan Technology“ means because it will tell you a lot about what this tanning lotion is capable of. You know how some indoor tanning lotions just make your skin look orange instead of making it darker? This product by Millenium Tanning is here to make sure that never happens again – with some help from the tanning booth or bed, it will give you exceptional dark bronze results. The Extreme Silicon Emulsion Blend, combined with some other ingredients, will leave your skin feeling smooth and soft after every use, which is always something you should look for in an indoor tanning lotion. Most importantly, the results you’ll get using this product are long-lasting, both regarding dark tan and moisturization. However, you should be careful when you apply the lotion because if not spread evenly on the skin, it will leave some streaks. Another great feature is the smell – you’ll surely enjoy the Cotton Blossom fragrance that will last throughout the day. Also, this product is available at a budget-friendly price, which makes it great and affordable for long-term use. Australian Gold is already known as a manufacturer of high-quality skincare and tanning products, so it’s no wonder that this lotion is considered one of the more popular ones on the market. Since this is an accelerator and not a bronzer, it will give you more natural tanning results; the color of your skin will become darker and golden, rather than orange, which, I’m sure you’ll agree, is what you want from an indoor tanning lotion. The fragrance, called Cocoa Dreams, is something worth mentioning because it smells delicious and it will prevent that embarrassing odor you get after using a tanning booth. However, don’t get fooled by the name of the fragrance, it smells nothing like cocoa; it’s hard to put your finger on it, but trust me, it smells heavenly. It could be described as a tropical vacation trapped inside a bottle – you’ll certainly enjoy it. The formula of the lotion combines three crucial things needed for great-looking skin – nourishment, moisturization, and protection; you’ll need all of this if you plan on regularly visiting a tanning salon. Your skin will inevitably get damaged by using the tanning booth often; that’s why you need to invest in a lotion that will keep those wrinkles away and leave you with the bronze tan you always wanted. Before you can even think about getting that perfect sun-kissed skin, you’ll need to get a base tan; accelerators are ideal for this as they not only speed up the process but make the color last longer, too. All in all, as an accelerator, this tanning lotion is ideal for those just starting the tanning process. The Australia Gold Cheeky Brown is also filled with different ingredients – vitamins A and E, native Australian oils and herbal extracts; they help moisturize the skin and keep it looking healthy. Some of those herbal extracts also act as bronzers, so you’ll get a perfect base tan naturally. What makes this product even more beginner-friendly is the uniformity of the results – your skin will tan evenly and gradually, so you don’t have to worry about those orange and brownish streaks everywhere. That is partly due to the texture of the lotion that isn’t too runny, making it easy to apply. One of the main advantages of this tanning lotion is the fact that it can be used both indoors and outdoors. In a way, when you choose this one, you’ll get a two-in-one product, something that will be equally effective when used for beach tanning and sun beds. Also, let’s not forget the sweet fragrance of this product, because it’s an important feature, especially in indoor tanning lotions, where the after-tan smells are a possibility. With a price that is significantly higher than other tanning lotions on my list, I know you’re wondering what is it that this product has to offer and is it worth the money. Let’s start off by saying that Designer Skin as a brand is widely known for their high-quality skin care and tanning products. It’s no surprise then that their Luminary tanning lotion is one of the best selling ones on the market. Chances are the first tanning session will be enough for you to notice the results, even if you have fair skin and don’t tan easily. The product is made to suit a variety of skin types, from fair to dark complexions. In case you were wondering what the „25x“ written on the bottle is, it means that it’s 25 times stronger and more potent regarding bronzers than a standard lotion. That’s what allows it to give such fast and long-term results. To sum it up, with this product you do get what you paid for, there’s no doubt in that. Many indoor tanning lotions may promise similar results, but in case you want to be sure it will do the job it’s meant to do, go for this one. There are many reasons why everyone talks about it as one of the best tanning products out there. In case you were wondering, my choice for the best indoor tanning lotion 2018 available on the market, and the one I use personally is the Millenium Tanning New Solid Black Bronzer Tanning Bed Lotion. It has many of the qualities I’ve mentioned are important in this type of lotions and while not being overly cheap, it’s still reasonably priced – enough to not hurt your budget seriously if you decide to use it regularly.